BA to end 737 operations? Hilton has opened a DoubleTree at Reserva del Higueron, whilst strictly not Malaga (the airport is about 12 miles away) it is likely to be known for the major city close by. A change to the timings on the London City – Exeter service is one of the many timetable alterations in Flybe’s 2015-16 winter programme which has now been published. A full day is offered for business travellers from either end of the route, previously customers from London needing to be back at Exeter Airport early afternoon in order to catch the one hour flight. Not the first UK airport to offer such a scheme, that honour fell to London City Airport (LCY) nearly 30 years ago, Heathrow has announced plans to trial a steeper approach for aircraft landing. Are you a journalist, or budding journalist, interested in writing about travel? If you read BTN you are half way there. Business Travel News is adding to its staff. 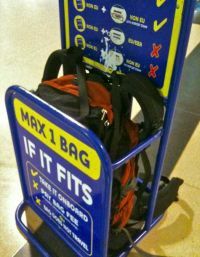 The announcement (see BTN 2 August) that British Airways has changed its rules for ‘carry on’ luggage has really confused travellers. If you now go one way on a certain carrier but fly back on a competitor you may be faced with different rules! IATA has muddied the waters even more (see BTN 22 June). Britain’s five leading airports in terms of passenger numbers all reported significant traffic increases for July. Heathrow, Gatwick, Manchester, and Luton saw record figures, with Stansted getting closer to its all-time 2007 record. When the CAA publishes its figures for the month, probably in October, it will almost certainly name July 2015 as an all-time UK high. A “green” ATR 72 prototype has been flown as part of the “Clean Sky Joint Technology Initiative (CS JTI)” test campaign. As excessive drinking in airports continues to dominate this summer’s headlines, new research from Holiday Extras has revealed that the scale of the issue may be even greater than first feared. What’s more, the identity of the biggest pre-board boozers may come as a surprise! Now clearly established as the world’s busiest international single runway operator Gatwick is pressing on with its campaign for the government not to proceed with Sir Howard Davies Airports Commission recommendation. Air France has announced that it will be flying its A380 to Mexico with the launch of daily flights from next March. Initially the airline will operate three times weekly from 1 January. Next January has been confirmed by SWISS for the unveiling of its new flagship Boeing 777-300ER, the first of nine. A return flight from Gatwick to Verona on 29 September could mark the end of British Airways Boeing 737 operations after 38 years. Emirates have announced what is claimed to be the world’s current longest non-stop flight, from Dubai to Panama, from 1 February. It will be the airline’s first gateway in Central America, providing convenient connections to Latin America, South America and beyond. Delta Air Lines will reduce the number of flights to Dubai from its Atlanta hub starting 1 October as part of a Middle East capacity cut. The airline will fly between four and five times per week, down from daily service this summer. Dutch prosecutors have found what they believe could be parts of a Russian Buk missile system at the site in eastern Ukraine where Malaysia Airlines Flight 17 was brought down last year. Luton Airport is now the UK’s major gateway to Israel following Monarch Airlines announcement last week that it is to introduce services to both Tel Aviv Ben Gurion (TLV) and Ovda (VDA). easyJet and El Al already operate out of Luton to Ben Gurion and Monarch was in the past an Ovda charter customer. InterContinental Hotels Group has launched a new delivery robot at the Crowne Plaza San Jose-Silicon Valley hotel. The robot, named Dash, was created by Savioke, makers of the Relay robot. Based in Santa Clara, CA, Savioke specializes in robot solutions for the hospitality industry and was first featured by BTN 8 September 2014 AND FINALLY. It is now promoted to the serious pages. Dublin could be a connecting airport with Aer Lingus for Ryanair according to Michael O'Leary? Technology is clearly the ‘in thing’ as far as air travel is concerned with London hosting three important gatherings within the next few months.